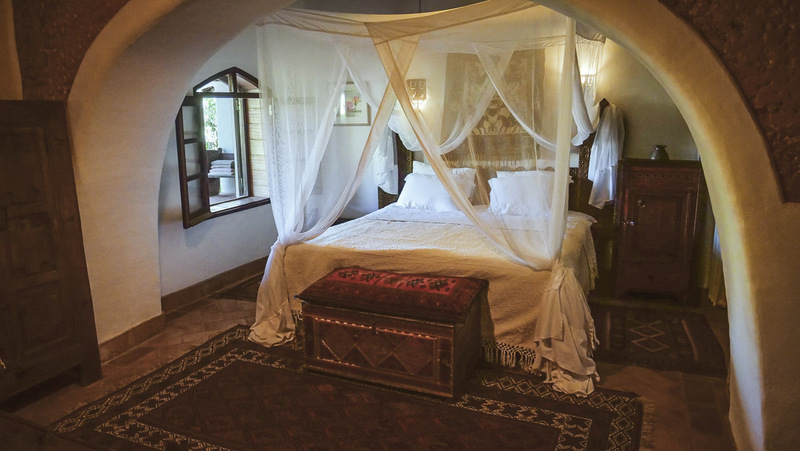 Filled with genuine antique furniture and rugs, Oxala’s master bedroom is shady and snug, cool in summer and warm on colder days. It has a kingsize bed, an en-suite bathroom and a walk in closet. A peaceful and wonderful bedroom to sleep and snooze in. The very large sitting room is spacious and cozy at the same time. There are two comfortable couches, multiple easy chairs and divans, a table ideal for board games or dining, a desk and a wood fireplace. 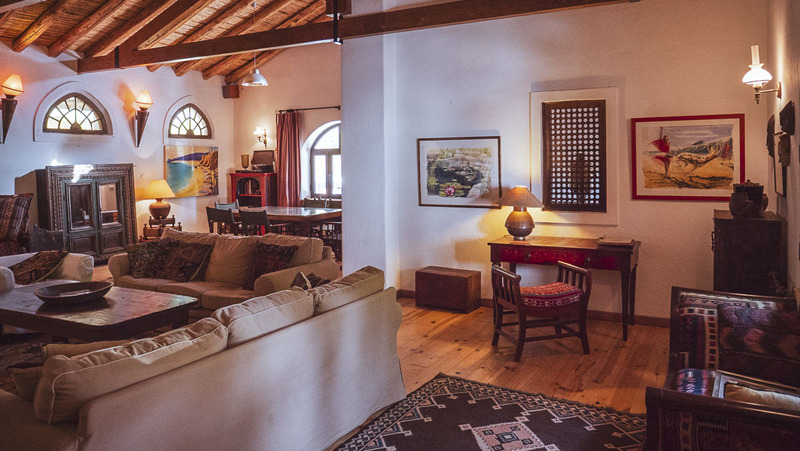 Like the rest of Oxalá, the room is furnished with genuine antique furniture, lamps and rugs, and due to the design of the windows is cool during the hot summer days. 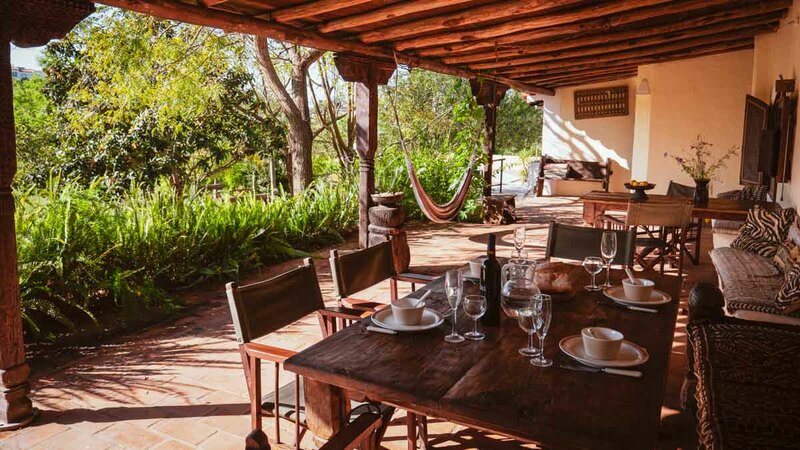 The wide, long, spacious veranda is the de facto communal space at Oxalá. Shady, with lovely views of the garden, a handy serving window to the kitchen, two large tables, an antique couch, a hammock and multiple comfortable directors chairs, the veranda is a prefect space to relax, whether alone or with company. 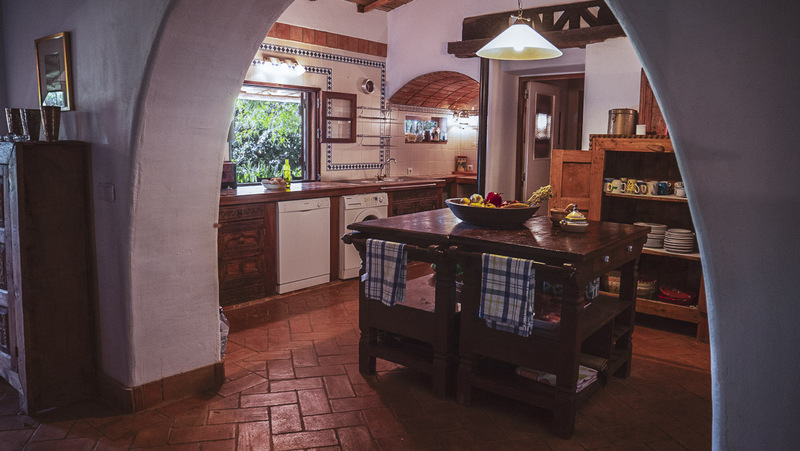 The kitchen in Oxalá is spacious and cozy. It has a serving window leading out to the veranda, a central food prep area, a cooker, a microwave, a dishwasher, washing machine and is fully stocked with cooking implements and tableware. Cooking is a joy in this lovely, beautiful kitchen, and guests often find themselves congregating here. 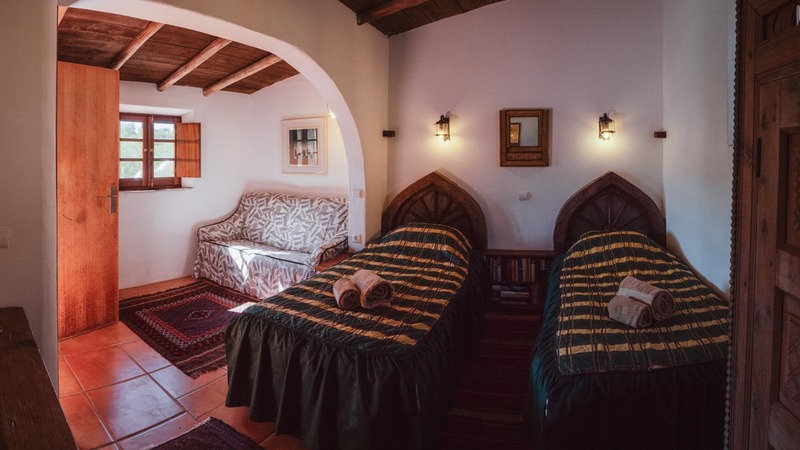 Both the main house and the Carob Suite have a double bedroom and a twin bedded room. The Master bedroom looks out over the veranda and has a workspace with wifi. The Carob Suite is shaded by a great carob tree and overlooks the pool. Oxalá sleeps eight people. A cot is available for an infant. See more photos of the other bedrooms here. The pool, besides it’s gorgeous and unique shape, is perfect for children. The slope from the shallow end to the deep end is very gradual, so perfect for children of all heights. 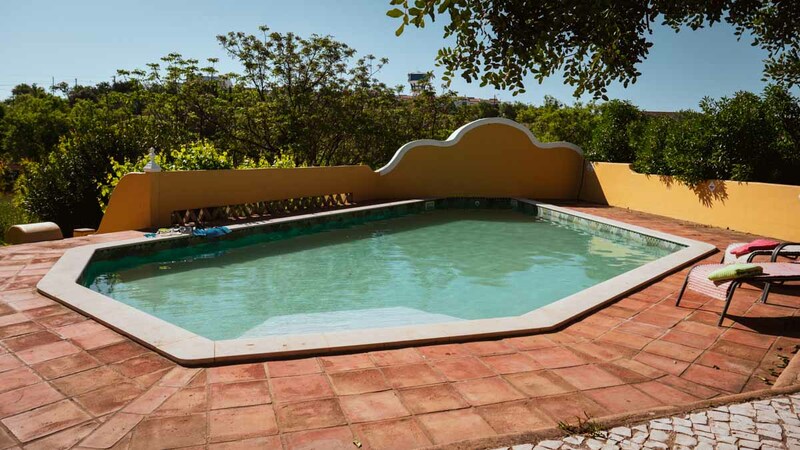 Surrounding the pool is ample space for sunbathing and sun loungers are provided. There is also a barbecue area shaded by a huge alfaroba tree. 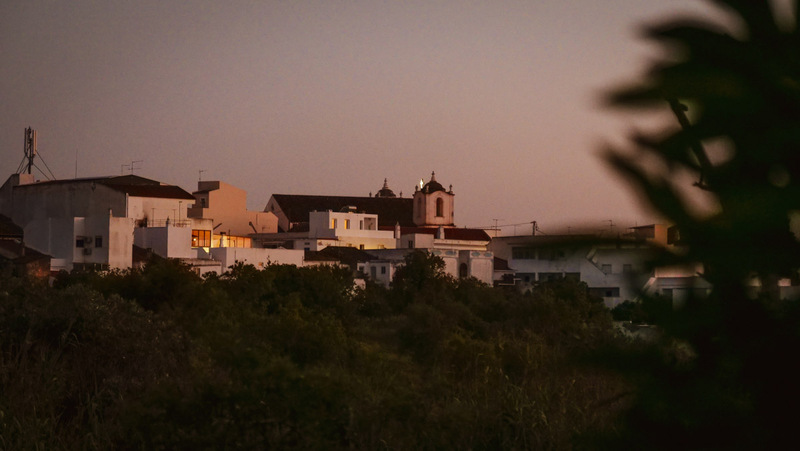 The local village of Estombar is virtually untouched by the chaos of Algarve tourism, but does have all the amenities you need. For a delicious authentic Algarvean meal, visit Charneco’s Restaurant. There are numerous cafés, a market selling fresh fruit and veg, bread, fish and meat, 2 mini markets and a hypermarket a mere 5 minutes drive away. The old farm is set in the wild countryside with figs, almonds and gigantic olive trees close to a small unspoilt heritage village. There are plenty of places for everyone to find a favourite spot, on a veranda, under the grapevines or by the barbecue and pool. 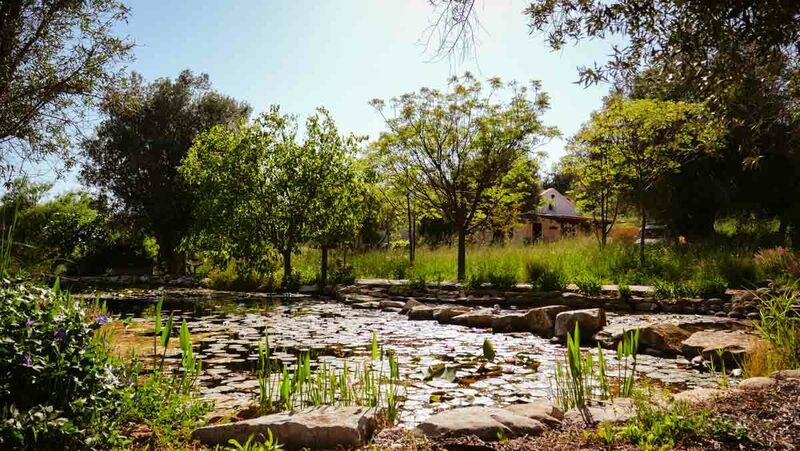 A shaded bench beneath olive trees overlooks the water-lily pond.This is a farming community so you will waken to cockerels crowing, the church bell ringing, dogs and donkeys greeting the new day. Use this enquiry form to check availability for renting Madrigal. If your dates are available you will be able to submit a booking enquiry. Please double check your reservation details before clicking on "Send Equiry" button. Prices in GB Pounds based on current exchange rates. Actual rates may very at time of booking.